NEW YORK - It isn't easy being Killmonger. Michael B. Jordan opened up about the toll playing the villain in "Black Panther" took on his mental health. "I went to therapy, I started talking to people, starting unpacking a little bit," he said. 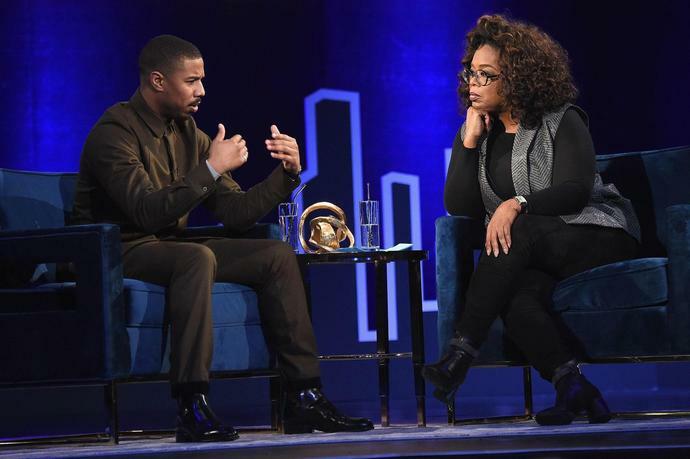 Jordan discussed his process for getting into character Tuesday in conversation with Oprah Winfrey at the taping of her "SuperSoul Conversations" TV special. "I was by myself, isolating myself," Jordan said when Winfrey asked where he went to "get all that nastiness" to play the Marvel super villain. "Of course it's an extreme, exaggerated version of the African diaspora from the African-American perspective, so to be able to take that kind of pain and rage and all those emotions that Erik kind of represents from being black and brown here in America … that was something I didn't take lightly," Jordan said. "I didn't have a process" for being Killmonger, Jordan added, "I just did whatever I felt I needed to do or whatever I felt was right in the moment every step of the way." However, "I didn't have an escape plan, either," he confessed. "When it was all over, I think just being in that kind of mind state … it caught up with me," Jordan said. "It was a little tough for me at first," Jordan said about getting out of the mindset of his character. "Readjusting to people caring about me, getting that love that I shut out," he continued. "I shut out love, I didn't want love. I wanted to be in this lonely place as long as I could." He said that seeing a therapist "helped me out a lot," despite the criticism men face about receiving mental health treatment. "Your mind is so powerful. Your mind will get your body past a threshold that it would have given up on way before," Jordan said. "Honestly, therapy, just talking to somebody just helped me out a lot. As a man you get a lot of slack for it. … I don't really subscribe to that. Everyone needs to unpack and talk."